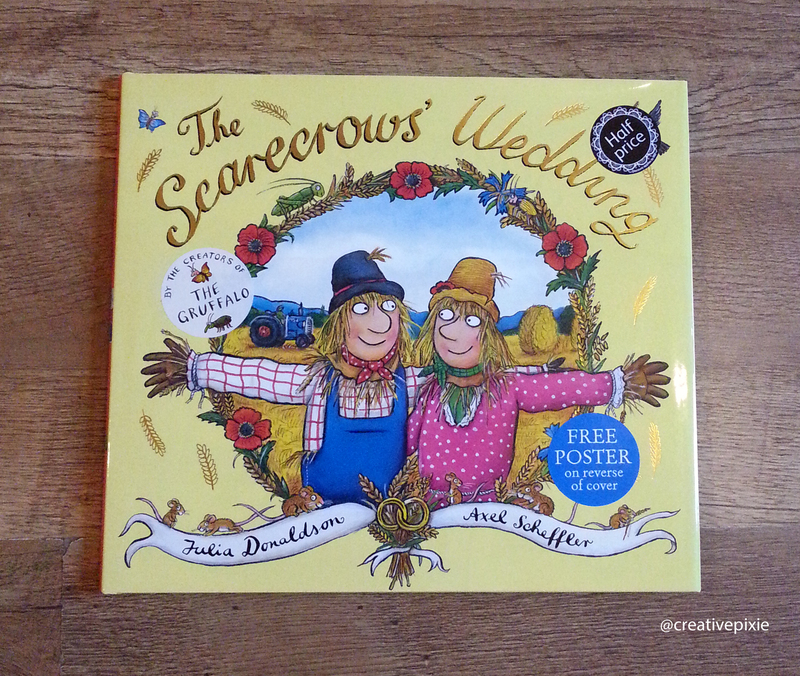 A couple of weeks ago saw the release of The Scarecrows Wedding the latest childrens book from Julia Donaldson and Axel Scheffler (the creators of The Gruffalo, Room on the Broom and Tabby McTat to name a few). Cheeky me noticed that they still had a copy in their window display so Mr Pixie asked if the sales assistant could get the very last copy out of their window. Well after much moving of various books (and almost completely destroying their whole window display) we were the proud owners of the book and at half price too! The story is about 2 scarecrows Betty O’Barley and Harry O’Hay who are planning their wedding. They draw up a list of everything they’ll need for their big day and set about finding these items. Harry gets separated from Betty as he has to go farther than he expected so the farmer creates a new scarecrow called Reginald Rake to take his place. Does Harry find everything on the list and does Reginald succeed in taking his place on the farm? You’ll just have to get yourself a copy to find out. This copy of the book is a lovely hardback which came with a free poster on the reverse of the dust jacket. It is a good story with the rhyming that children love and it’s sure to become a firm family favourite.